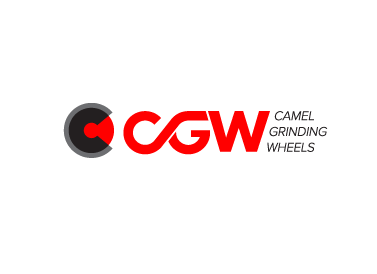 The CGW grinding wheel is made up of abrasive grains held together by a bond. By varying the properties of the abrasive, the type of bond, and the structure of the wheel, it is possible to produce innumerable grinding characteristics. There are two main categories of grain: Aluminium Oxide - For grinding high tensile steel, i.e. hardened or high speed steels. Silicon Carbide - Low tensile steels, i.e. cast iron and non-ferrous metals. Vitrified - The rigidity of this bond is excellent for precision grinding and fast stock removal. Resin - Organic bond makes the wheel tougher, suited for heavy-duty operations, high operating speeds, rough grinding, and cut-off applications. A - Brown Aluminium Oxide: The most common of all grains. This grain is used for heavy-duty general purpose work. WA - White Aluminium Oxide: The high friability of this grain gives it the characteristic of fast and cool cutting. Suitable for light grinding of steels of all kinds, particularly on tool and die steel. WAB (AZ) - White Aluminium Oxide + Blue Bond: Particularly suited for grinding HSS over 55 RC. Provides exceptionally cool, fast cutting action. Requires minimum dressing. Available also as WAR - White Aluminium Oxide + red bond - when there is a need to differentiate from AS. AS - Ceramic Aluimium Oxide: Ceramic grain, blended with white aluminium oxide, creates a wheel with maximum grinding performance and life. Excellent for form and corner holding. Available in AS1, AS3, and AS5. PA - Pink Aluminium Oxide: Good general purpose wheel. The grain is tough but friable, excellent on large surface areas. RA - Red Aluminium Oxide (Ruby): This grain is harder than PA and WAB. Good for highchromium steel. DA - White & Brown Aluminium Oxide: Mixed grain Combining A and WA. 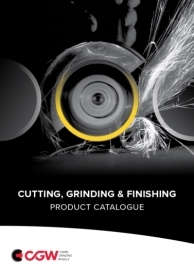 Ideal for precision grinding operations such as large surface grinding. 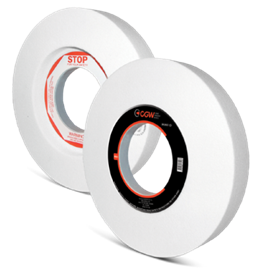 WAY - White Aluminium Oxide + Yellow Bond: Used primarily in wheels with very open structure. For creep feed grinding with continuos dressing. Saturn - WAG - White Aluminium Oxide + Latest CGW-Developed Bond: Used primarily in wheels with very open structure. Excellent for creep feed grinding with non-continuos dressing. Jupiter - WAP - Special wheels for bladegrinding at 80 M/S. HA (32A)- Monocrystal Aluminium Oxide: A strong, sharp grain, suitable for a wide range of materials and applications. Especially good for high alloy steels that are sensitive to heat. C - Black Silicon Carbide: Sharper than Aluminium Oxide and therefore more effective in grinding low tensile materials and nonferrous metals. GC - Green Silicon Carbide: More friable than C, recommended for grinding cemented carbide cutting tools. 5-9 Structures.